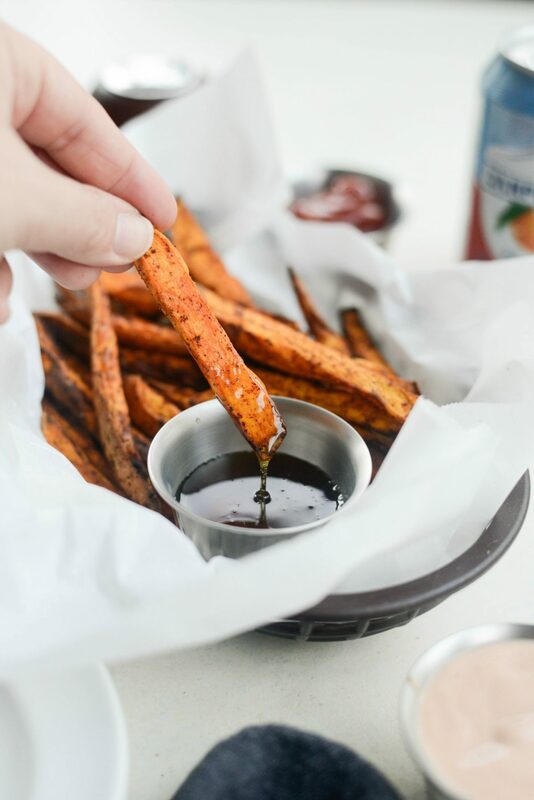 You only need a handful of ingredients to make these Air Fryer Crispy Sweet Potato Fries! 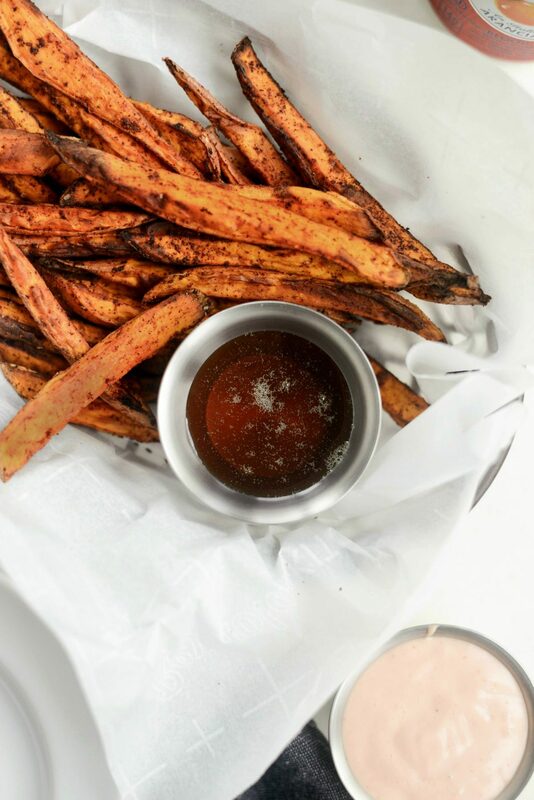 Seasoned with garlic, onion and chipotle powder, these sweet potato fries are not only healthier than traditional French fries, but also simple to make and crisp up beautifully in the air fryer. 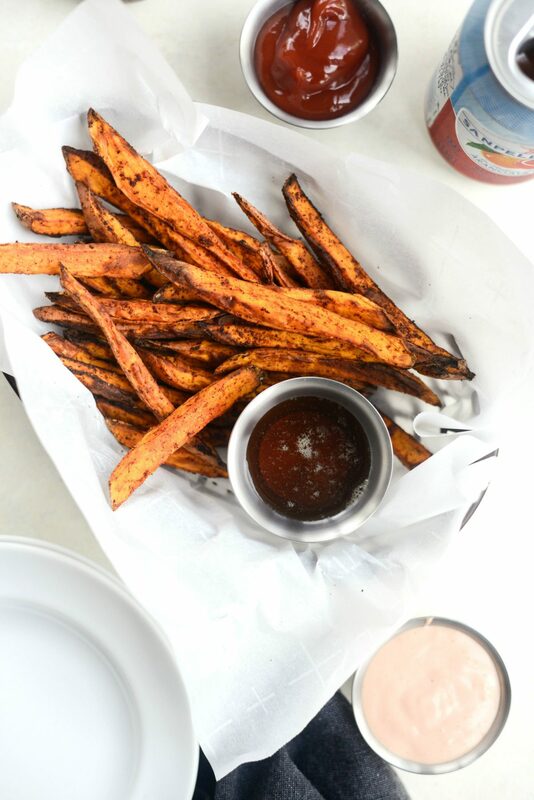 Sweet potato fries are one of my favorite kind of fries! Waffle fries are a very close second, but until I get whatever tool that’s needed to make that intricate design, I’m sticking with my chefs knife and the sweet potato. 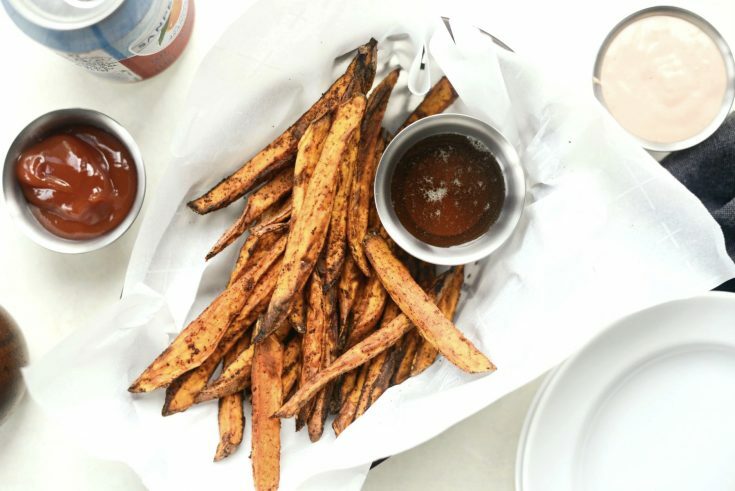 It’s unfair to compare regular French fries with sweet potato fries. Because the reality is that I’ve yet to make sweet potato fries that will stay crispy indefinitely. It’s just the nature of the potato. Unless they are super-ultra thin (and you somehow manage to not burn them in the process) otherwise the crispy factor only lasts a few minutes. 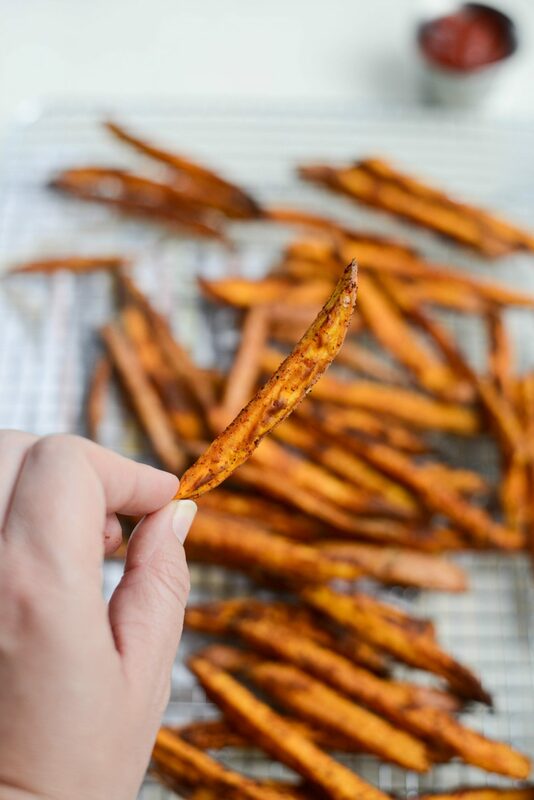 In the past, oven baked/roasted sweet potato fries get crispy but it’s a fine line between thin and too thin which can result in burning and sticking to the pan. So yes, you guessed it! Air frying is my new favorite method. 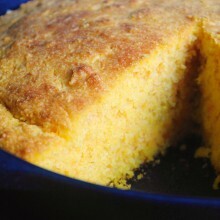 Crispy exterior, buttery interior. No sticking, golden brown and perfect. YES! 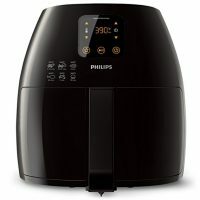 Now the air fryer [affiliate] isn’t going to change the fact that over time the moisture within the sweet potato will eventually soften them up a tad. However these air fryer crispy sweet potato fries didn’t get all draggy and floppy at all and were still dipable and delicious. One trick I do for crispier fries is…(dramatic pause)…I buy smaller, more stubby sweet potatoes. My theory is that I will get more uniform pieces and not too many super long fries, which risk gettin floppy or draggy. 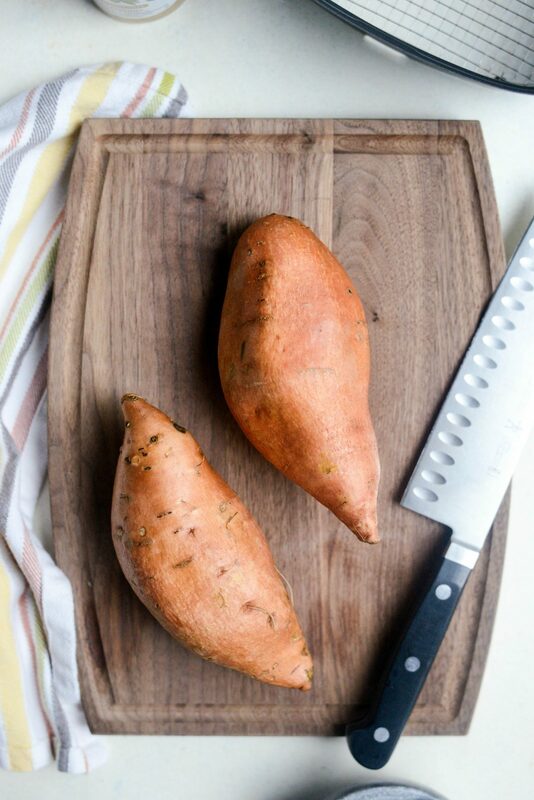 First, scrub the sweet potatoes well and then with a sharp chefs knife, slice them into planks and then into thin sticks. 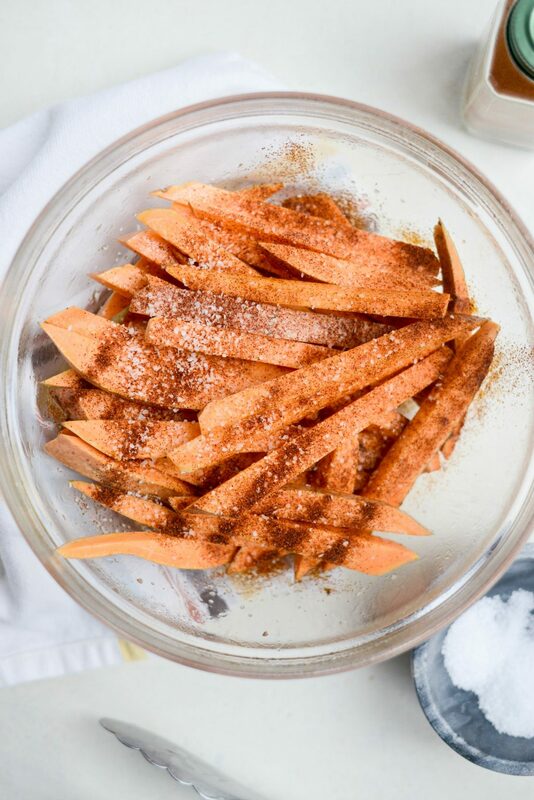 Cutting the sweet potatoes into uniformed sticks will help cook the fries evenly, so some fries aren’t overcooked while others are undercooked. 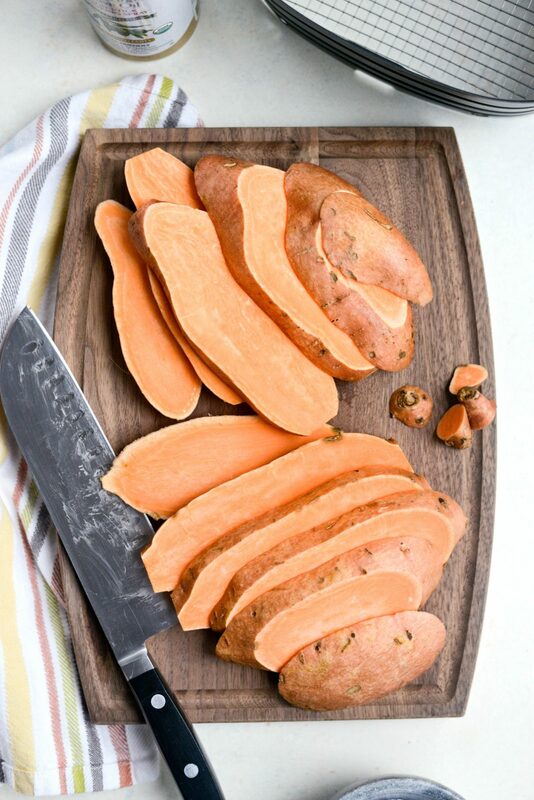 Add the sweet potato sticks into a medium bowl. Then spray with the non-aerosol olive oil spray and toss until lightly coated. 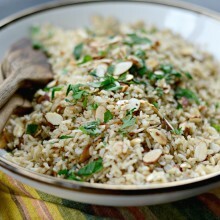 Alternatively, you could toss them in 1-1/2 teaspoons to 1 tablespoon olive oil. Season the sweet potatoes with a couple pinches of kosher salt. Then a few shakes of onion and garlic powder, paprika and chipotle powder. Spray the basket of your air fryer with olive oil spray and then preheat to 390-400° depending on your model. Work in batches, laying a few seasoned sweet potatoes in an even layer into the basket. Air fry for 4 minutes before tossing either by shaking or turning with tongs. Then continue to air fry for an additional 3 to 4 minutes or until the exterior is crisp and golden. It’s perfectly okay to go ahead and check on them as they air fry. I highly recommend serving them right out of the air fryer. This way you get to enjoy them crispy. I literally make and serve after each batch. However, you can also add them all back into the air fryer basket to rewarm. 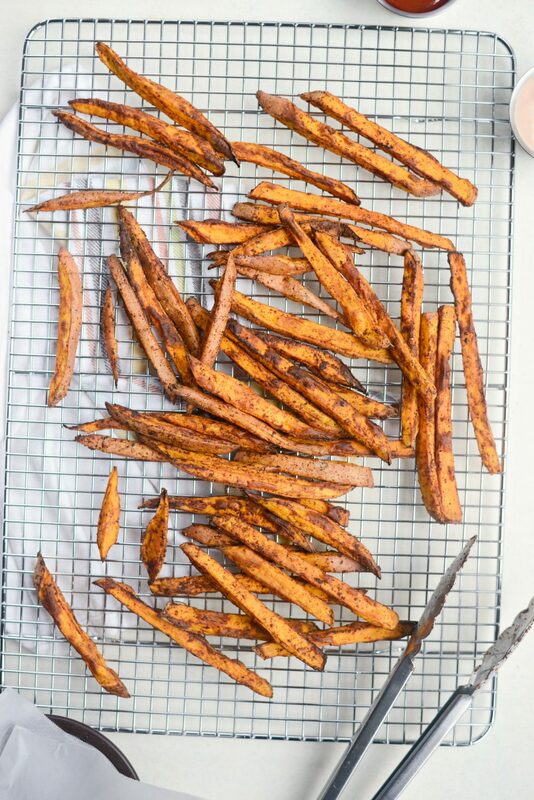 Remember the smaller the sweet potato the crispier the air fryer crispy sweet potato fries. As far as dipping sauces go. I made two different kinds, plus *cringes* ketchup. Two dips that are literally 2 ingredients each. A fry sauce and a maple honey. 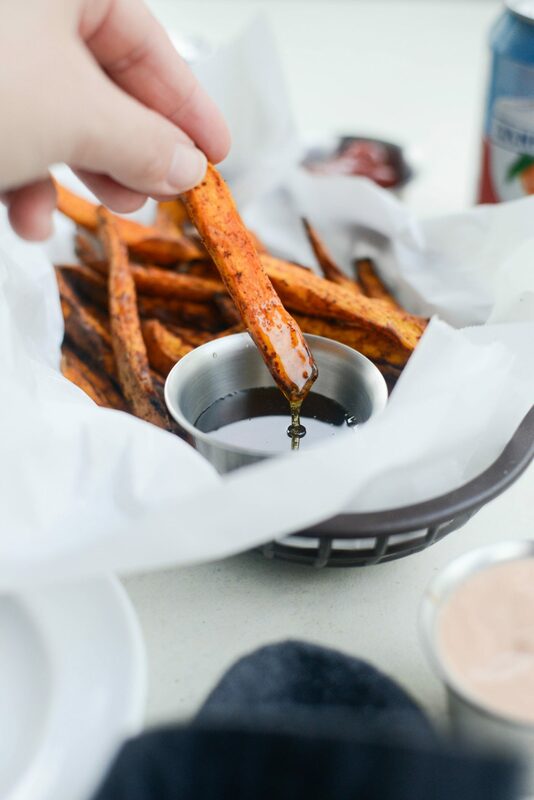 The maple honey is delicious with the smoky spices on the air fryer crispy sweet potato fries. It also just so happened to be my personal favorite. Enjoy! 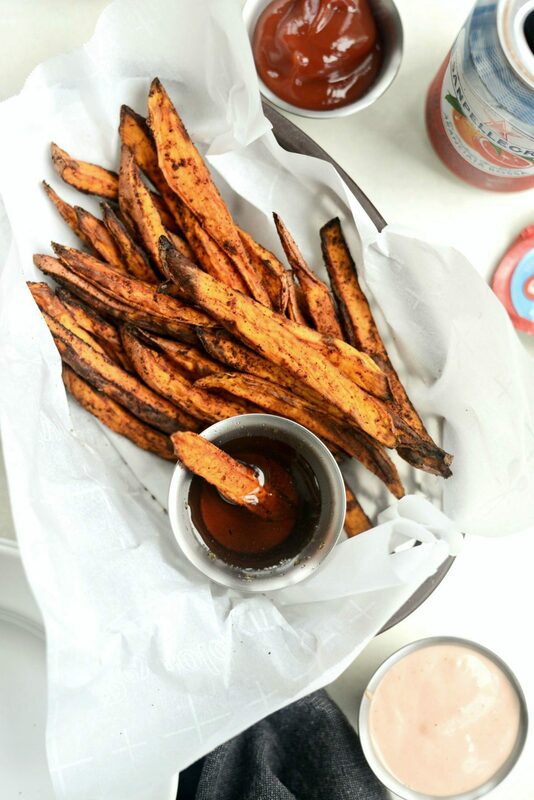 And if you give this Air Fryer Crispy Sweet Potato Fries recipe a try, let me know! Snap a photo and tag me on twitter or instagram! 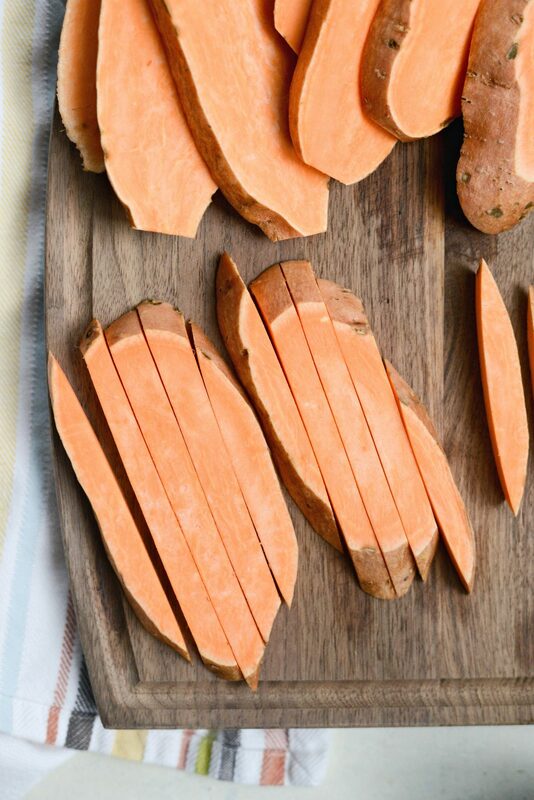 Slice sweet potatoes into 1/2-inch planks and then into equal sized strips or "fries". Place them into a medium bowl and spritz with olive oil spray, tossing and spraying until coated. Season with a few pinches of kosher salt and a few shakes of paprika, onion, garlic and chipotle powder. Toss to coat. Spray the basket to your air fryer and preheat it to 390-400° (depending on your model). 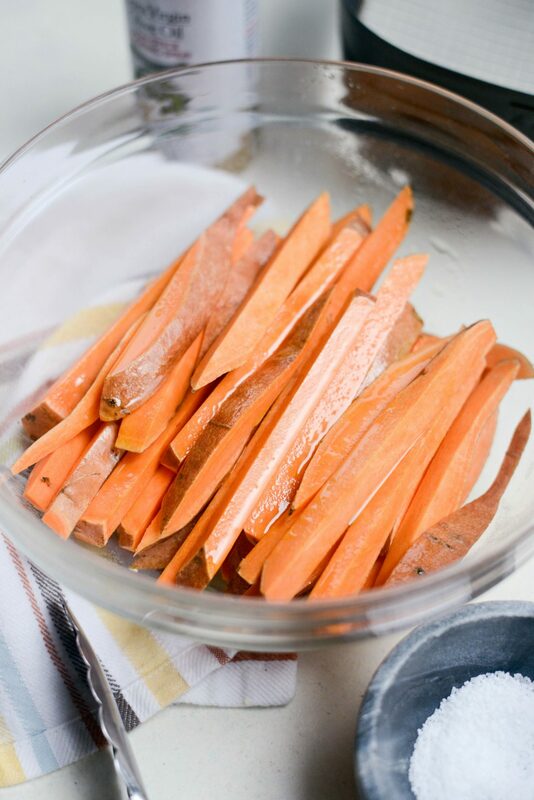 Work in batches of 4 or more, place a few of the seasoned sweet potato fries into the basket in an even layer. Try not to crowd the basket. Cook for 4 minutes, shake the basket or use tongs to flip the fries and continue to air fry for an additional 3 to 4 minutes. 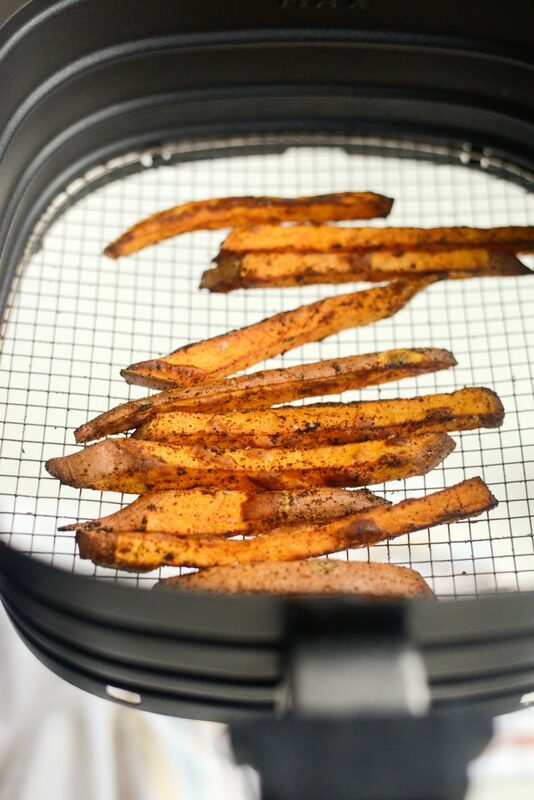 Transfer the crispy sweet potato fries to a wire rack before repeating. Note that smaller end pieces may be done after the first 4 minutes.Serve immediately. 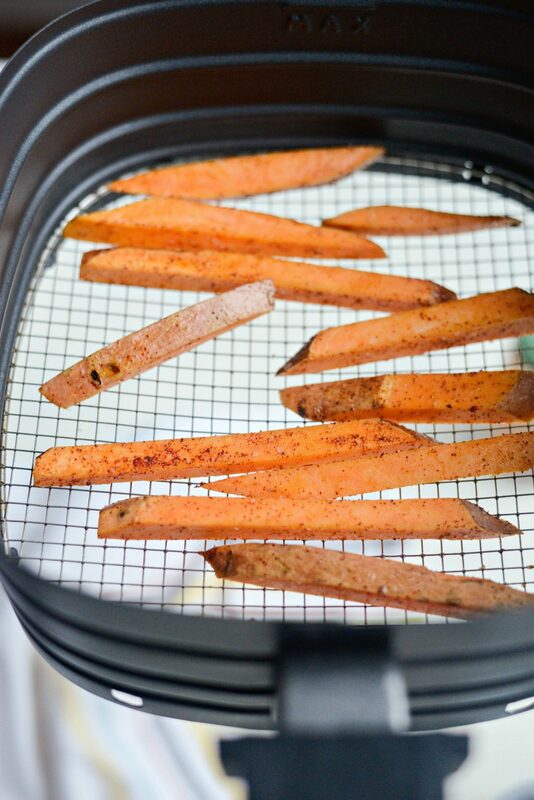 Or to warm them back up, add all of the sweet potato fries back into the air fryer and cook for an additional 2 minutes. yum! 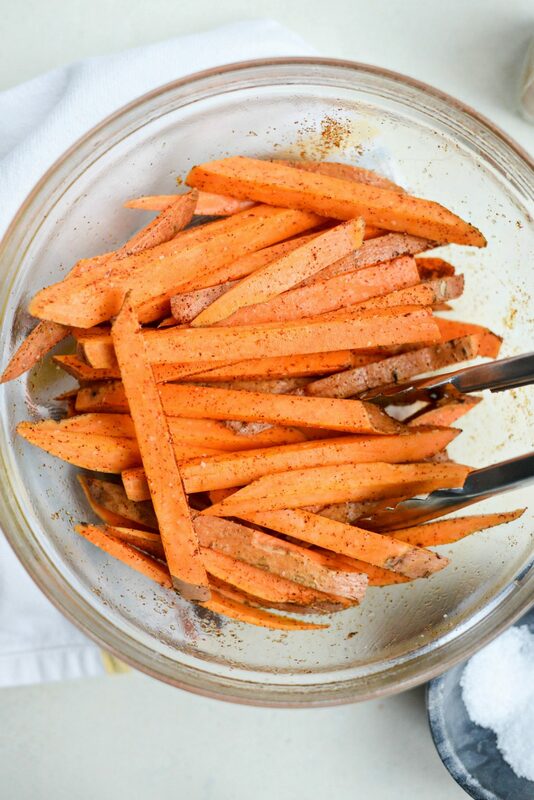 i love sweet potato fries – we probably roast sweet potatoes at least twice a week. definitely going to try this method! i haven’t had as much success baking them in my air fryer compared to regular potatoes, but i’ve just been guessing about temps/time. Hi, I just tried these – first thing I cooked in my air fryer and they turned out amazing! They were crispy and yummy! I will certainly make these often! I didn’t have anything to make a dipping sauce with, but instead used my ranch salad dressing and it was good! I bought an off-brand air fryer…just like the small Black & Decker brand, but it’s from China! The instructions and few recipes were hilarious! I had to find something more…ugh…readable! I came across your recipe – so easy! Thank you so much! I’m so happy to hear it, Vicki!